Individual & Group Lessons, Etc. Parents and new players are encouraged to print out our download "Chess Basics for New Players," as well as the various 'tutorials'. Players may enroll in the Saturday Morning Chess Club (SMCC, below) when they know how all the pieces move. "Center-Members" are provided with a free account on Chess.com, our official online practice site. The SMCC (below) will take a new player from the basic moves into beginning and intermediate strategy, and beyond. For private lessons see below. The club will NOT meet on some Saturdays, including major holiday weekends such as New Year's, Memorial Day, Independence Day, Labor Day, Thanksgiving and Christmas. 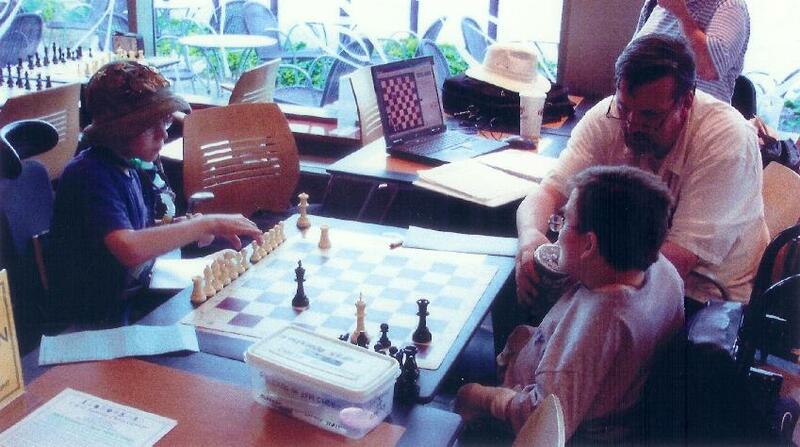 The Saturday Morning Chess Club (SMCC) is held at Lakeforest Mall (LFM), in Gaithersburg. SMCC is open to Center members, both children and adults (Membership Application). Due to popular request memberships are offered in 10-, 15-, and 20-session groups (registration form) with no time limit on attendance. Students must supply their own equipment but a few "loaner sets" are usually available. Each of these 'group sessions' may include individual mentoring as well as the group practice and review of recorded or internet games. This depends on each student's practice record and the availability of their recorded games from class or Chess.com. Individual mentoring is tailored to each student's level of experience from beginners through experienced tournament players, and may be provided by staff or student CITs. An individual program includes everything from basic concepts and tactics through analysis, computer use, and tournament strategy. The SMCC is not intended to replace 'private lessons'. Check with the coach to determine if 'private instruction would be beneficial for your student (most beginners do not require it). Regular 'outside practice' is expected two or three times a week (more is even better) and so free membership on Chess.com is included for all C&O members. There we maintain a 'club presence' for all C&O Family Chess Center programs, members, and former members. Students are encouraged to create a "Chess Journal" (a loose-leaf binder in which to keep printed lesson notes, game records and other instructional materials). For maximum benefit, parents should plan for children to spend an hour, or more, on practice two or three (or more) times each week in addition to the weekly sessions. This may include practice with a computer program, with siblings, friends, or parents, and should include playing online at Chess.com, where our staff may monitor their games. Parental encouragement and supervision in setting up a 'regular' practice schedule is essential to meaningful student progress. Parents should download, print, and share with students our 'New Player Information' packet. Parents need not stay in the food court during the class but are welcome to do so. Parents are requested not to remain directly in the chess area during the class unless enrolled as a student or volunteering as a club aide under club guidelines, and should return for students by 10:45 a.m. The coach is often gone by 11:00 a.m. Some students remain to play in the regular Lakeforest Mall club, but our staff and mall employees are not respolsible for students who remain after the SMCC is over. Registration in SMCC includes at least ten classes. Longer registrations are available with greater discounts. Students are also welcome to remain at the mall after SMCC, for practice and play during the regular LFM chess club, if they wish. The regular LFM club members meet even when there is no SMCC. Unlimited free-play is available until the mall closes, seven-days-a-week. We suggest you bring your own set and board. The mall management has provided chess tables as of late 2013. Saturdays and Sundays, 1:00 - 5:00 p.m.
No-school and early-release days, 10:00 a.m. - 4:00 p.m.
Evenings, 6:30/7:00 - 8:00 p.m. Call, or 'message' (on Chess.com), three days, or more, in advance for best results. Or contact CBPancoast@gmail.com with questions, or to schedule a lesson. Learning the basic rules and moves may be done for 'free' on-line (on various websites) and from our C&O 'downloads. Parents who wish to teach very young children may also use our 'free' resources. Therefore we don't usually recommend private instruction for new beginners. However, if you really want individual instruction for new players, regular rates apply. New players under the age of six 'must' be acompanied by an adult (counts as two students) but parents who wish to teach their own children may take an individual lesson for themselves. The C&O Family Chess Center currently has a number of member and student groups available on Chess.com at no extra charge if you are enrolled in one of our programs or are a Center member (Online-Membership Application). We receive no money from Chess.com, but it is very useful if students are taking lessons or classes with us. While it is not necessary to register through the center there are several benefits to allowing us to create the Chess.com account, especially if you are enrolled in one of our programs. Students enrolled in our programs have access to a wide variety of lessons and other activities (which supplement our classroom materials and instruction) including unlimited play against our other Chess.com members, computers (at different strengths), and our own coaches. Our coaches, in turn, will have access to your Chess.com games and ratings, and can direct you to specific exercises and areas of study if you ask. Students are encouraged to practice three, or more, times a week for an hour or more (younger students for shorter periods). Progress in Chess.com ratings will eventually translate into rating points on your club and USCF rating.